Jaipur: Amid a grand public ceremony and convergence of top leaders of many non-BJP opposition parties, Congress leaders Ashok Gehlot and Sachin Pilot were on Monday sworn-in as Chief Minister and Deputy CM of Rajasthan. 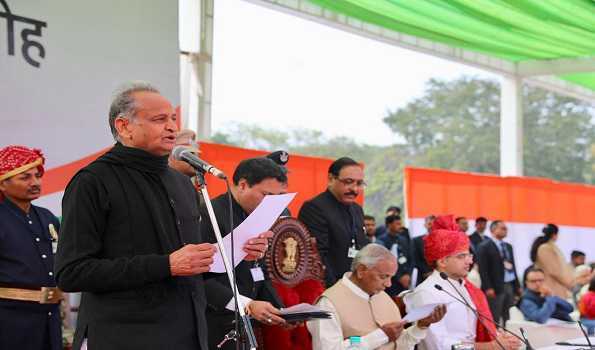 Governor Kalyan Singh administered oath of the office and secrecy at the public function held at the historic Albert Memorial Museum Hall here today in presence of galaxy of politicians, party workers and large number of people.Mr Gehlot assumes the post for his third term. Former Prime Ministers Dr Manmohan Singh, HD Deve Gowda, Congress president Rahul Gandhi, Andhra Pradesh Chief Minister N Chandra Babu Naidu, Karnataka Chief Minister Kumar Swami, Puducherry Chief Minister Narain Sami, DMK leaders Stalin and Kanimozhi, LJD leader Sharad Yadav, former Bihar Chief Minister Jatin Ram Manjhi, former Jharkhand Chief Minister Hemant Soren, NC leader and former Jammu and Kashmir CM Dr Farooq Abdullah were present. Outgoing Rajasthan Chief Minister Vasundhara Raje, Assembly Speaker Kailash Meghwal, Mr Gehlot's wife Ms Sunita, Mr Pilot's wife Sara and their other family members also graced the ceremony.